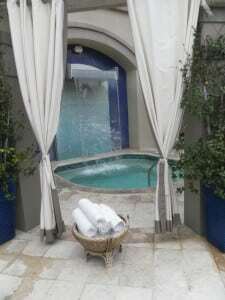 First class but laid bac k like the island itself, every pool and Jacuzzi pulses with a soothing waterfall at the beachside Ritz Carlton on Amelia Island along the north coast of Florida. Each applicant is vetted by Spa director Tina to ensure every therapist has a passion for customized healing, like Douglas who included a tip for evening leg length – who knew one was shorter? He says we should always stand up planting both feet on the ground at the same time. Most of us don’t, resulting in a crooked stance. A fix for that is to lie on your back and cross the short legged ankle over the other and then have a partner gently lift slightly and continue to stretch that leg off to the side. Repeat every two weeks for reformation to an upstanding straight individual, so to speak. The amenities are all you would expect from a Ritz Carlton spa, and here they bring the salt theme of the resort into play with a foot exfoliation that may be added to any treatment. Combine this with the option of Moroccan oils for hair hydration during a Surrender massage and you have head to toe ecstasy. “Heaven in a Hammock” is an exclusive relaxation treatment invented on site utilizing of course a hammock to combine zero gravity with massage to elongate the spine and increase range of motion. More unique specials include a Wrap Two Remember for couples and Boot Camp for Beach Bodies. Day guests of the spa may enjoy the adult only relaxation pool and lucky guests staying in the luxurious accommodations have all access to the spa’s saunas, pools, and relaxation lounges which provide cacophonic tranquility with or without scheduled treatments. Take time to meander over the peaceful marsh boardwalk and shoreline to be lulled by the waves before calling it a day at the spa. Anywhere you go, you will hear The Ritz Carlton mantra – “It’s My Pleasure”. It is truly a pleasure and treasure for all! See all the properties and spas at www.ritzcarlton.com.